Scott Burrows played college football and was a top-ranked kickboxing champion when an automobile accident left him a quadriplegic. In his new book, ‘Vision Mindset Grit: How to Stand Up When Life Paralyzes You’, Burrows shares the inspiring true story of how he triumphed over adversity. Astoundingly, through his dedication to these principles, Burrows was able to overcome the odds with remarkable results. At 19 years old, Scott Burrows believed he was invincible. He was playing football for Florida State University and was a champion kickboxer who had appeared on ESPN. He had no idea that the spontaneous and seemingly innocuous decision to go on a weekend getaway with friends would forever change his life. On the night of November 3, 1984, Burrows was in an automobile accident that left him critically injured. His neck was broken and he had a serious spinal cord injury. He was diagnosed a quadriplegic. However, during his recovery, he made the decision to focus on positives instead of fighting his new condition. To help sustain his positive thinking Burrows focused on three principles: vision, mindset, and grit. First, his vision for his life had drastically changed, and it was important for him to develop new goals and aspirations. Second, he needed to adjust his mindset in order to meet the new challenges he faced. Third, he needed to have grit, or the day-to-day determination to persevere even when circumstances call for retreat, giving in, or remaining stagnant. Astoundingly, through his dedication to these principles, Burrows was able to overcome the odds with remarkable results. He has even participated in activities many would think are “off limits" for a quadriplegic, including snow skiing, scuba diving and skydiving. After relaying his inspiring story of triumph, Burrows outlines the principles of vision, mindset, and grit so that the reader can apply them to his or her own life. In each chapter, he further defines and reinforces each principle, and includes practical techniques to help the reader develop their own plan of action. Burrows hopes that his book helps readers take charge in the face of their own challenging circumstances, personally and professionally. “The power of choice is life-changing,” says Burrows. “I find that when I share that power with others, it has a major impact on their lives,” he concludes. 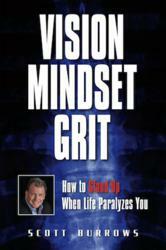 ‘Vision Mindset Grit: How to Stand Up When Life Paralyzes You’ is published in print by Pearhhouse Press, Inc., and in eBook format by eBookIt.com and is now available from popular online retailers, including Amazon.com, Barnesandnoble.com, and Apple’s iBookstore. A star athlete and fierce competitor, Scott played college football at Florida State University under legendary coach Bobby Bowden and was a top-ranked kick boxing champion whose last fight was broadcast by ESPN. On November 3, 1984, a serious automobile accident left him paralyzed from the chest down and diagnosed a quadriplegic. Despite his grim diagnosis, Scott refused to be sidelined! He took control of his life by implementing three powerful principles: Vision, Mindset and Grit. Through painstaking focus and unshakable optimism, Scott boosted his recovery and achieved seemingly unattainable results that astonished doctors, therapists, family and friends alike!